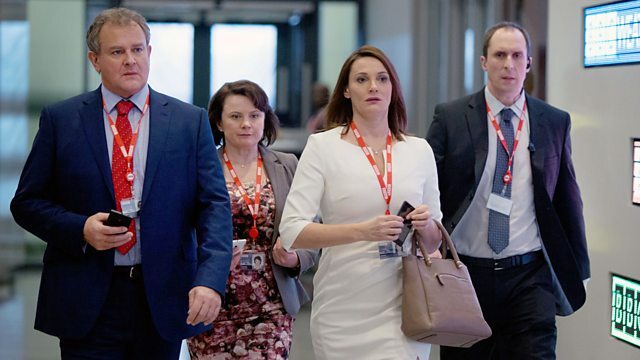 A one-hour special marks the return of the award-winning comedy about the BBC. One year on and head of values Ian Fletcher has finally got his own office. A one-hour special marks the return of the award-winning comedy about the BBC. One year on and head of values Ian Fletcher has finally got his own office. He and the team have a new set of challenges to rise to, including the impending royal visit of HRH Prince Charles. The question is, which of the management team will get to shake the royal hand? Head of BBC brand Siobhan Sharpe and her team at Perfect Curve have been tasked with giving a makeover to the BBC coverage of Wimbledon following rumours of a bid from a rival broadcaster. Her response is a brand mash-up to end all brand mash-ups. Meanwhile, over on the creative frontline, entertainment format producer David Wilkes is trying to come up with the next big factual entertainment series after Britain's Tastiest Village failed to fly. He's got the title - Up Town, Down Town - he just hasn't got a show or a cast. Finally, intern Will Humphries's security pass won't let him into the building. Is it a technical problem or something more significant? Meet the team working alongside former Olympic head of deliverance Ian Fletcher.